There's good news ahoy for our local Waterways - with the announcement this morning that Chesterfield Canal has been chosen to host a prestigious national festival at it's Staveley Town Basin. The Chesterfield Canal Trust says it will be 'delighted' to host the Inland Waterways Association National Trailboat Festival during the Spring Bank Holiday 2016. Highlights will include an illuminated parade of boats on the Saturday night and a convoy right up to the River Rother at St Helena's on the Monday. The Trust ran previous IWA Trailboat Festivals at Tapton Lock in 2002 and 2005. Both were hugely successful, as was the IWA Campaign Rally held at Kiveton Park in 2009. Robin Stonebridge Chair of the Trust said: "We are delighted that the IWA has chosen to return to the Chesterfield for its 2016 Trailboat Festival. The boaters who came here in 2002 or 2005 will see a great change, both on the canal and in the surrounding area. "Canals get restored by continuously making the case, by hard graft and by spreading the word and building support from across the country. Although we still have eight miles to restore, the Festival will be a good way to celebrate the Trust's efforts thus far and for visitors to have a really good time here in North East Derbyshire." There will, say Trust members, be vital differences between this event and the annual Canal Festivals held at Staveley - notably the number of boats. It is expected that dozens of trailboats will be moored in the basin and back towards Constitution Hill Bridge. Many will be decorated, creating a really colourful spectacle. The Festival will include boat rides, canoeing, children's rides, plenty of entertainment, dozens of stalls plus food and drink including a Real Ale bar. As the name implies, trailboats are towed on a trailer, thus they can go on stretches of water that are inaccessible to normal canal boats. The trailboats will be launched down the slipway at Staveley Basin. The Chesterfield Canal in Derbyshire is currently cut off from the rest of the canal because the section between Staveley and Kiveton Park has not yet been restored. Thus normal narrowboats can not get to Staveley. 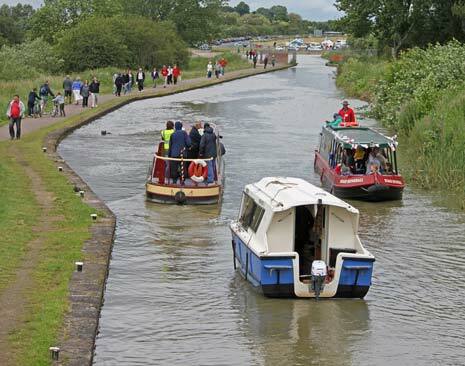 IWA national chairman Les Etheridge said: "Our 2016 Trailboat Festival will help to demonstrate the community benefits that flow from the revival of functioning waterways. As well as providing a great day out, we hope the festival will stimulate renewed support from the public and local interest groups for the Trust's sterling restoration work." Derbyshire County Council owns this section of the canal and they too are behind the Trust all the way, with Cabinet Member for Highways, Transport and Infrastructure Councillor Dean Collins saying, "The newly developed Staveley Basin has made Chesterfield Canal an attractive area for boats and we're delighted to be hosting the National Trail Boat Festival in Derbyshire next year. "We're committed to helping to improve Derbyshire's economy and tourism has a massive role to play. "We're looking forward to welcoming the boating community to Derbyshire to enjoy our beautiful county and all it has to offer."